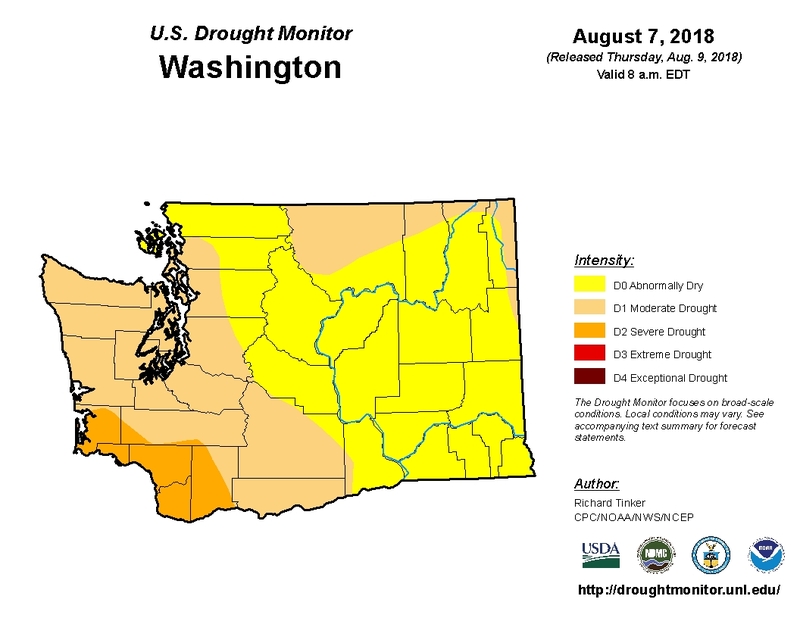 The U.S. Drought Monitor says the entire state of Washington is abnormally dry. In Oregon, nearly 90 percent of the state is facing moderate to severe drought. “What we’re experiencing is part of what the entire western united states is experiencing,” Kristin Johnson-Waggoner said. She’s a communications manager with the Water Resources Program in Washington Department of Ecology. Last winter, snowpack in Washington was exactly where it needed to be so that when it melted, there was plenty of water in rivers and streams. But in May, warmer temperatures and drier air set in. “That sort of depleted that reservoir that we would have depended on,” Johnson-Waggoner said. Johnson-Waggoner said that in Washington there’s no drought emergency declaration on the horizon, but some communities are taking action. On the west side of the state, city officials in Kelso have asked residents to limit how much water they use because of low flows on the Cowlitz River. Officials in Forks, normally one of the wettest towns in Washington, on the Olympic Peninsula have made a similar request. On the east side, mandatory outdoor water restrictions have been issued for Cheney, near Spokane. Johnson Waggoner added that any long-term impact to the state’s water supply will depend on what happens this winter. “You know, how much rain do we get? How much snow do we get?” she said. Oregon is facing even drier conditions. Governor Kate Brown has already declared a state of emergency for two counties due to drought. The most recent weekly drought report from Oregon’s Water Resources Department says statewide, stream flows in July were less than 50 percent of normal. Residents in Colton, Oregon have also been directed to conserve water. Oregon’s Water Resources Department is also restricting water use in Douglas County.